Human brain. 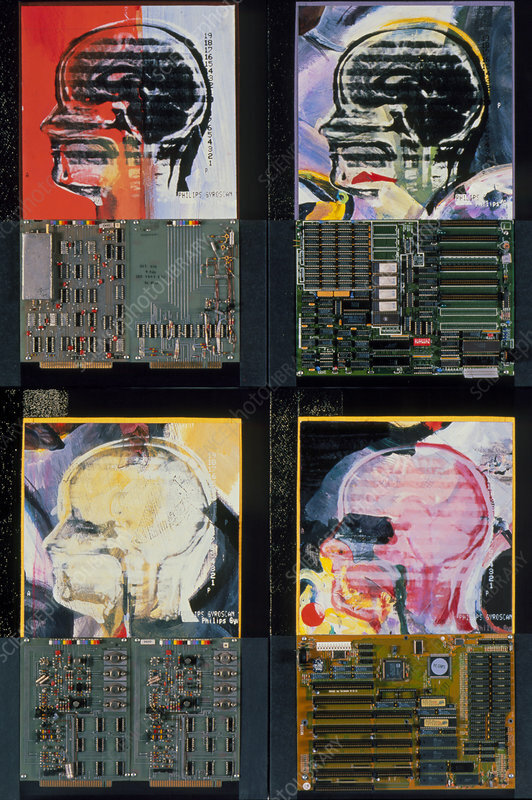 Work of art by Canadian artist Verle Harrop of four painted human brain scans and computer circuit boards. It is titled: "Remote Sensing: Mapping - data vs vision" (1993). The collage shows sagittal views of a human head scanned by Magnetic Resonance Imaging (MRI). A profile of the human face and a healthy brain are seen. Textiles and acrylic paint have been used, together with computer circuit boards. The artist uses multimedia to create vivid images that juxtapose the human brain with technology and remote sensing. Verle Harrop specialises in neurological imaging and is artist-in-residence at Dalhousie University in Nova Scotia, Canada.